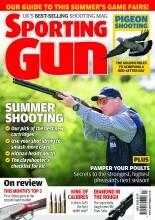 Does winter pigeon shooting ruin game shooting? My farmer reckons it does and won’t have me anywhere near the place during the season. I have often shot pigeons coming into roost in my little wood just as the pheasants have been going up to bed, all around me. I’m not saying you should do this on a regular basis, and certainly, pushing birds off their roost is not to be recommended, but I think the disturbance argument can be overdone. As far as decoying is concerned, game will take virtually no notice of a decoyer going about his work, provided he does not leave the hide every two minutes, or has a dog flying here, there and everywhere. That said, you also need to look at it from a gamekeeper’s point of view: would you take the chance of chasing game away, just so someone can enjoy a few hours recreation? Don’t forget, it’s a bit of sport for you, but his livelihood depends on him putting the maximum amount of birds over his boss’s guests’ heads.